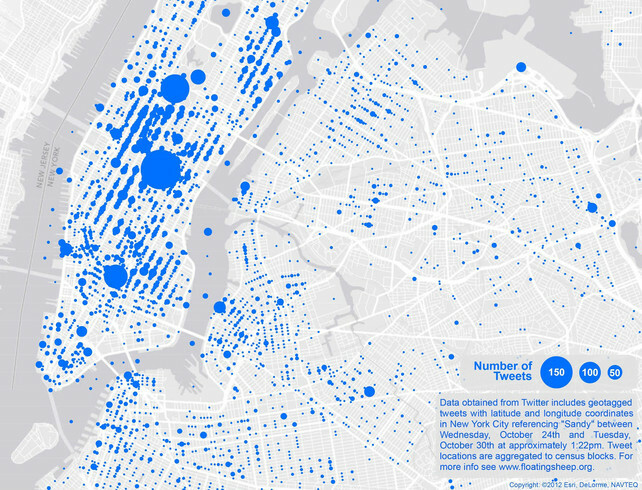 "Floating Sheep created this map of geotagged tweets that occurred in the days before and during the storm. What they found was that Manhattan, with the greatest population and wealth, put out the most tweets. Some events prompted noticeable responses in various geographic areas--the best example being the infamous crane dangling on 57th street, which appears as a big blue circle just south of Central Park--but other events, like evacuations and explosions, can’t even be spotted on this map."